Home New York Yankees New York Yankees: Was Luke Voit A One Hit Wonder Or Is He A Gem? 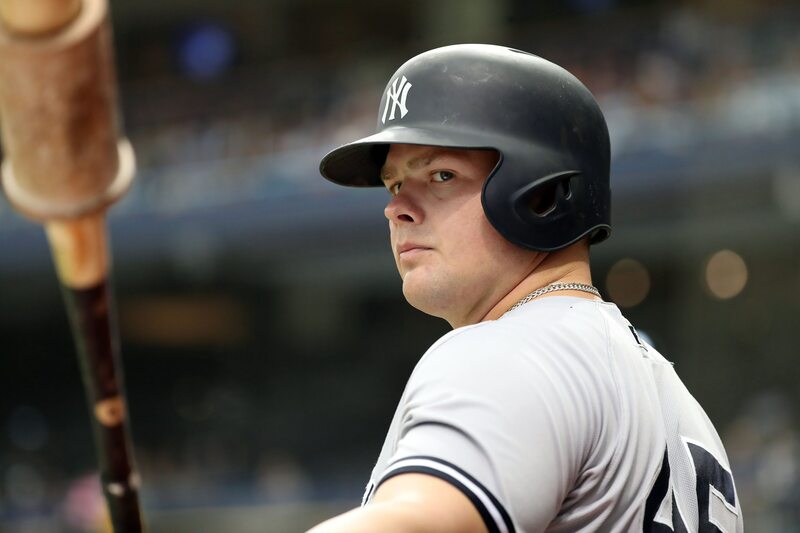 New York Yankees: Was Luke Voit A One Hit Wonder Or Is He A Gem? On July 28th, 2018, the New York Yankees acquired first baseman Luke Voit in a deal that sent LHP Chasen Shreve and RHP Giovanny Gallegos to the St. Louis Cardinals. This trade made Yankees fans extremely happy, but not because of Voit. Chasen Shreve had been with the Yankees since 2015, and overall pitched poorly and Brian Cashman could not move him to the minors due to him being out of minor league options. There was hope for fans that Shreve would be DFA’d or traded, and that finally happened. Shreve had an ERA of 4.26 in 2018, and in 2016 had an ERA of over five. He wasn’t working out and traded him just to get rid of him because he really had no spot and the same as Voit with St.Louis. In 2017, Luke Voit appeared in 62 games for the Cardinals 28 hits, 18 RBI, and 4 HR. That would translate of a major league average of .246 that year. In 2018, he started the season with the Memphis Redbirds, the AAA affiliate of Cardinals. He bounced up-and-down from the MLB to AAA a lot that season, not really able to get comfortable and batting for the Cardinals, but .299 for the Redbirds. Once he was traded to NYY, he was assigned to the Scranton/Wikes-Barre Railriders and continued to rake, batting .310. With Greg Bird continuing to struggle and injuries still an issue, Voit was called up and made an immediate impact for the Yankees. Once Voit was called up, he went right to work and took Greg Bird’s spot away. Bird was playing extremely poor, making errors and batting a terrible .199 over 82 games. The more Voit played, the better he played. He hit a whopping .333, had an OBP of .405, and his slugging was through the roof at .689. In 39 games, he amassed 14 HR and 33 RBI. Also must note, the home-runs he was getting weren’t really with much help of the short porches down the lines of Yankee Stadium, he was hitting Aaron Judge like home-runs that were no-doubters. He would only really sit when there was a match-up with an RHP that Aaron Boone didn’t like, so Bird or new Miami Marlin Neil Walker would start. Though Voit had that instant success with the Yankees in 2018, many still wonder if he is the man in 2019 at first base. A lot of players have historically struggled in their sophomore season, and could he be the next? Neil Walker signing with Miami obviously takes away any thought of him returning in 2019 to play first. DJ Lemahieu has signed for the next two seasons to be a utility player, and though he hasn’t played a lot of first base recently, he could still be an option. Obviously, the Yankees still have Greg Bird, but it seems that he has played worse as more time goes on. Miguel Andujar could possibly play first, but that likely won’t happen unless the Yankees sign Machado. Entering the offseason, the Yankees were shopping a first baseman, expressing serious in then Arizona Diamondback Paul Goldschmit, now being traded to Voit’s previous home, St. Louis. Several men have the opportunity to win the first base job in Spring, but will it be Voit? If it is Voit, will he have the same success? Only time can find out. Meant to say NOT made up of shoulda,coulda,woulda !….sorry. Luke Volt will be the Yankees starting 1st Basemen. 30+ HR…90-100 RBI. Decent and growing Fielding Pct. FINALLY a 1st Baseman who’s made up of shouda,coulda woulda.! Let this guy play and just stand back!